The cabin/interior photo posted above is of a 26M rather than a 26x. This is an interesting example of a 26X pilothouse enclosure/ hardtop setup. Thanks! This is the same guy on the Mac site whom I have been trying to reach unsuccessfully. Three attempts to join the group have not worked, and the guy running the site, Heath, has not responded to three emails asking what to do or for assistance, so it seems that group is closed with no new members. Unless I am doing something wrong, but emails have not gotten any answer. So, unless the board opens up, or someone can tell me how to join if it is pilot error, there will be a need for a new outlet for any future Mac owners if they can't get on the other site. I got the boat down from Oregon and now the boat and trailer are CA registered and I am beginning work, waiting for a dry spell, but did some heavy cleaning. Cabin hatch is huge, needing a safe and practical storage , anyone has cut this in half or thirds..? Updates and maintenance to the site seem to be on hiatus. It has been that way for a while. Photos attached. I think the individual who posted these photos posted to the other site only once. It seems unlikely he will reply. Did you buy the boat? Any more questions? I have had my Mac26x for 14 years or so. Liberty One US Madison In. I really get what you are doing, I considered that same route myself but went with the low buck version here at first. I just bought a Catalina 22 for my adventure boat. Many places we will go the sails and mast might get left locked up on the trailer and in the truck, do to negative value in toting them along and other places we will be 90% at sail. Just an efficient fun way to go for adventures in non open water too. Many boxes get checked with the trailer sailer platform. I like to sew, so I might do some sort of a serious custom dodger on mine. I did it with a Catalina 22, swing keel, pop top, 8 HP Yamaha Ex long shaft, high thrust, elec start and tilt, a great little boat! Why carry a 250 HP engine with fuel, etc? Thanks for the pic's, that is where we are starting here at first, wanted the Macgregor for more cabin space but since I am new to sailing an learning that part of it, I thought the smaller boat would get us to the water more often. Hope we can cross paths some day. P.S. What did you plan for as far as MPG on the 8hp yamaha on the C22 ?? DD, Catalina 22 generally a cheaper boat than Macs. Make sure trailer is in good to excellent condition, this is critical, carry a spare, whatever boat you get. 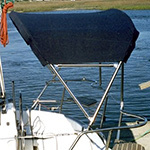 Pop top is enormous benefit, swing keel means you can beach and go in little water. Yamaha 8 and 9.9 ideal, I loved the elec start and tilt, made cockpit controls. Keep the rudder, if you get in steep or rough stuff you will need it. Lots of advice if you end up getting something. My deal was a 'hybrid' I removed all sailing parts. I don't care about MPG, I did three round trips from my slip in Tiburon to Angel Island on one 6 gallon tank, that's how I measured my use.